These light and healthy veggie filled shrimp spring rolls make for the perfect snack or lunch. While preparation of the fresh rolls may seem complicated, they just take a bit of practice. The rice wrappers are firm in the package (similar to pasta) and are softened with water before filling and rolling. Some brands of wrappers are thinner than others so I doubled them up for this recipe so they didn’t break as easily. I’ve partnered up with Earthbound Farm & TheFeedFeed to show you how to make these shrimp rolls using an Earthbound Farm Organic Salad Kit. Everything you need for a great salad comes prepped and ready to go, making these spring rolls a breeze. The salad kit comes with a mix of cabbage, romaine, kale, carrots, cilantro, wonton chips, sunflower seeds and a tangy tahini dressing. Rather than tossing the salad with the dressing, I serve the dressing as a creamy dipping sauce for the spring rolls. Founded in 1984, Earthbound Farm has established itself as one of the premier growers of organic produce. While I’ve used the Asian Chopped Salad kit in this recipe, it also comes in BBQ Ranch and Southwest - so there is surely something to please your liking. The method of cooking the shrimp in the heated pot after it is off the burner allows the shrimp to gently poach and not overcook. If you are using frozen shrimp, make sure they are completely thawed before poaching. To poach the shrimp, bring a large pot of salted water to a boil over medium heat. Squeeze the lemon juice into the water to provide flavor and then remove the pot from heat and add the shrimp. Cover the pot and let the shrimp poach in the water, checking occasionally until the shrimp are firm and opaque, about 10 minutes. Once the shrimp are cooked through drain and pat dry then discard the tails and set the cooked shrimp aside. In a large mixing bowl add the greens and vegetables from the salad kit along with the crispy wonton and sunflower seeds. Toss to combine. Working two at a time, wet two pieces of rice wrappers together in a large bowl of room temperature water until it is pliable but not gooey, about 6 to 8 seconds. This makes it thicker and keeps the rolls from breaking. Transfer to a flat, clean work surface. 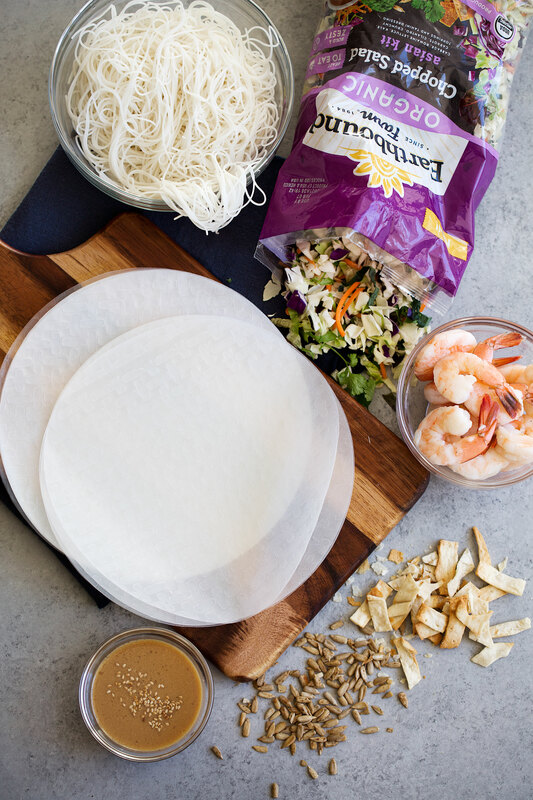 Arrange a small handful of the rice noodles at the bottom 1/3 of the rice paper so that you have plenty of room to roll. Add about 1/3 of a cup of the salad mixture on top of the rice noodles. Begin rolling the spring roll from the bottom upwards. After half a roll, arrange three shrimp along the edge and continue rolling. Once the first turn is tight, fold the right and left sides of the wrapper in, closing off the ends as though rolling a burrito. Continue rolling until the spring roll is secure then press the seam closed and place seam side down and shrimp side up on a platter. Continue with the remaining spring rolls. Add the dressing to a small bowl and serve the spring rolls immediately, they are best served fresh. Use the dressing for dipping. *Note: Earthbound Farm can be found at Costco, Whole Foods, Albertsons, Fairway, Meijer, Fresh Direct and Sprouts. To find a store near you use the store locator here. If the Earthbound Farm organic salad kits are unavailable to you then substitute with the following: ½ cup shredded red cabbage; 1 cup finely chopped romaine; 1 cup finely chopped curly kale; 1 medium carrot, julienned; ¼ cup chopped cilantro. For the dipping sauce: whisk together 2 tablespoons canola oil, 1 tablespoon tahini paste, 2 teaspoons soy sauce, 2 teaspoons rice vinegar, 2 teaspoons granulated sugar, 1 teaspoon toasted sesame oil, 1 teaspoon minced ginger, 2 cloves garlic, minced. **Note: Rice wrappers can be found in the Asian section of most grocery stores, at Asian grocery stores or online here.